Conor McGregor hasn’t fought in the UFC since winning the lightweight belt in November 2016 and then taking a detour into boxing—earning more than $100 million by fighting (and losing to) Floyd Mayweather Jr. last August. His hiatus from UFC has frustrated his rivals, who want a shot at the title—in particular, the Russian fighter Khabib Nurmagomedov, who called McGregor a “chicken” recently. 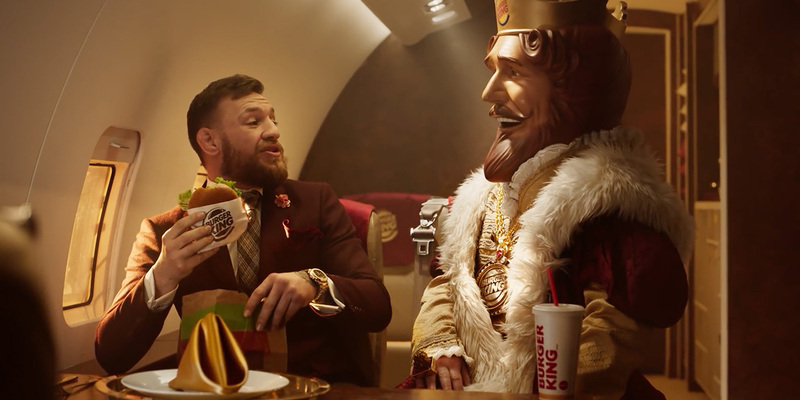 That particular insult has only helped McGregor add to his riches, though—as Burger King used it as an opening to have McGregor hawk its new Spicy Crispy Chicken Sandwich. In light of sharing in last year’s purse, it’s a bit odd that the Irishman would need even more money to “put Conor Jr. through college,” as he puts it in the spot, but that’s probably just the scriptwriters talking. The BK connection is that much richer considering the fast-food chain has been involved with fighters before—most notoriously, the brand’s King mascot joined Mayweather’s entourage for his high-profile 2015 fight against Manny Pacquiao, reportedly for a cool $1 million fee. McGregor refers to himself as a “king” in the new spot, but it seems that won’t last. While McGregor has said he will return to UFC fighting eventually, the league has already announced that the winner of an April 7 fight between Nurmagomedov and Tony Ferguson will inherit the UFC lightweight belt.